"This is the ONLY way I can get my husband and kids to eat Brussels sprouts, and everybody that tries this dish LOVES it! 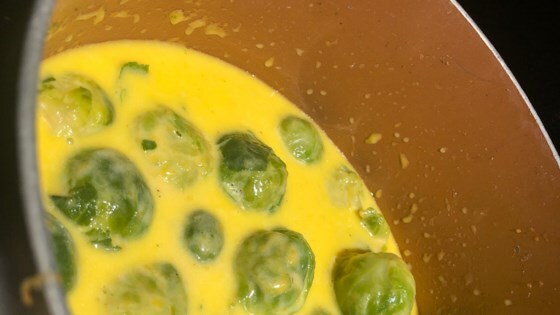 Mouth-watering creamy cheesy sauce slathered over Brussels sprouts so soft your teeth slide through them. You may need to double this recipe to have enough! I always make the sauce while sprouts are cooking, to save time and have it all ready at about the same time." Bring a saucepan of water to a boil; reduce heat to medium-low and cook the sprouts for 10 minutes. Drain, rinse in cold water, and set aside. Melt the butter in a saucepan over medium heat and stir in the flour, salt, and pepper. Cook the mixture until it turns a slight tan color, about 1 minute; whisk in the milk. Bring to a simmer, whisking constantly, and cook until thickened, about 2 minutes. Stir in the processed cheese until the cheese has melted and the sauce is thick and smooth. Transfer the Brussels sprouts into the sauce, stirring to coat. This recipe was great. I use gloucester cheese instead of velveeta type cheese. Very tasty way to serve brussel sprouts. My kids loved this. They now love Brussels sprouts. really tasty and easy. would definitely cut cheese sauce in half but that is a matter of taste. the others loved it the way it was. used cheddar cheese. Will make it again, SOON!! !